Recently had a makeover, not to bad a job either, ale was in good nick when I last visited, not everyones cup of tea but it's OK during the day (the only time I've ever been in here). 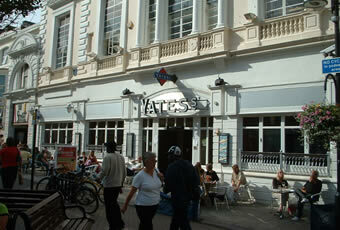 Yates'. If you want a fight, late at night there's only one place to go. Staff can be very rude. Stack em high, sell em cheap type thing. Usual Yates' style crowded, noisy, unfriendly, drunken affair, they can make any place terrible. Avoid it. Well it is a chain pub targeting everyone. Lot's of large screen TV's, big menus with 125 dishes to choose from and two (realish) ales. I had a Bombadier - a lacklustre encounter. An okay pub to watch Saturday football and you will always have a seat near a screen....but like I say - it's a yates. Not at all my kind of place, more a club than pub and the last time I turned up I think I was the older male there by some years. Dedicated beer drinkers avoid.